Tips for Selling Your Home: Make it More Marketable & Get a Quick Sale! You're here: Home » DIY » Home Improvement » Ready to List Your Home for Sale? 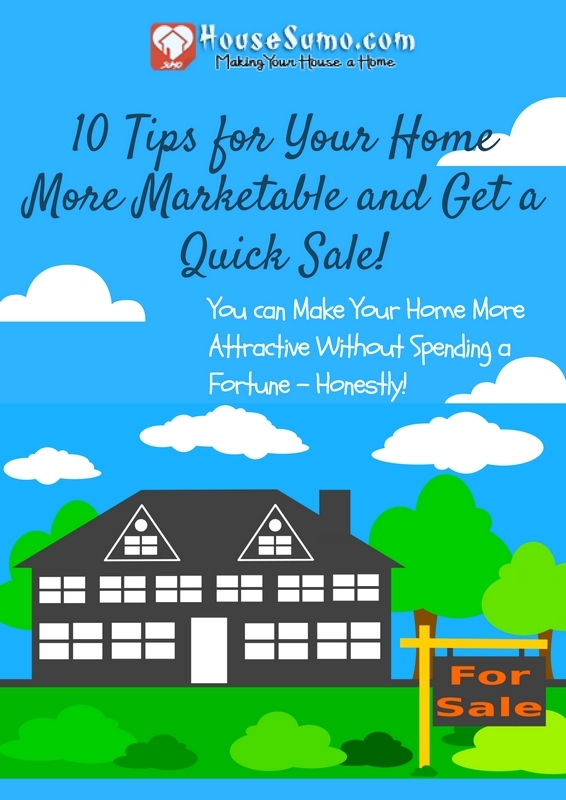 Ten Tips to Make it More Marketable and Get a Quick Sale! Tips for Selling Your Home — For the past fourteen years, we’ve lived in the southern part of New Jersey. America’s “Garden State” with one of the highest population density factors in the nation. We are also burdened with the nation’s highest property taxes, made even more intolerable by a 6.625% state sales tax which went into effect this year. Quite frankly, it has become ever-increasingly difficult and unpleasant living in the state. We are readying our home (again) to list it for sale. (When it was first listed a year and a half ago – just around the time that the housing market started to nosedive – we were offered just $60,000 under our asking price – which my husband turned down and refused to negotiate. He stood firm in his belief that we should get our full asking price on our home, listed at just under a million dollars. 10 Tips for Selling Your Home: You can Make Your Home More Attractive Without Spending a Fortune – Honestly! Interestingly enough, our realtor had said that in general, the ‘first offer is the best offer’ – and we found that to be true. We ended up pulling our house from the market so that our youngest daughter could finish her last year of school here. When you’re listing your own home for sale, keep my experience in mind. Your first offer from a buyer may very well be your best offer – the one that is most negotiable, the one that actually made the prospective buyers so impressed with your home that they took a chance to even make an offer – and speaking of chances, they’re probably quite high that this buyer will be willing and able to negotiate with you. Don’t hold onto the false hope or sense of pride that just because your house didn’t receive an immediate full price offer – very, very few homes in this market today so – that it isn’t a good one. Whatever the circumstances that prompt you to consider selling your house – empty nesters, a job transfer, downsizing, moving your growing family into a larger home – you, too, will be faced with the task of making your home stand out against all others in a very competitive market. I’d like to share some of the ideas and tips that we found and utilized to make our home stand out. Selling your home is probably the biggest financial transaction you’ll ever make. Referrals and recommendations are really, really important! Fixing up your home for sale can be as simple as cleaning out clutter, weeding, and painting! Whatever you do, get a really, really good realtor for your listing agent. Don’t be tempted to go with your cousin, who just received his realtor’s license; he doesn’t have the experience, savvy or ‘network’ that you’ll need. Interview at least three agents; I’d suggest, especially in this market, that you interview between four to six from different agencies. Ask friends and neighbors who have sold their homes what they thought of their realtors. Try to avoid ‘dual’ agents, agents who represent both the buyer and the seller. A friend recently found herself in the position of having her home represented by an agent who brought in buyers for her. When it came down to the negotiations and the nitty-gritty, dirty part of hammering out the details, guess what – he was, legally, representing the sellers he brought into her home and their best interests, as opposed to hers. Although they finally got the deal done, it was a very bitter, angry experience for her which may still have some legal ramifications floating out there. You want to feel that your agent is looking out for you, and doing his/her best to get you the maximum price for your property. If they do bring in a buyer, stand firm on the principles that led you to have this individual as your listing agent: don’t compromise when you really can’t, don’t allow yourself to be badgered into accepting a price that really is way too low for your own needs. There is actually a legal document in most states that the seller must sign to acknowledge the fact that their agent, once they bring in a reliable buyer, is working as a dual agent for both parties. If your agent doesn’t happen to bring up this ‘small’ detail, You be sure to do so yourself. This can be very, very important if and as the deal goes forward. Quite often, you will hear what a house ‘sold’ for – the owners may, in fact, have had to lower their asking price by tens of thousands of dollars or maybe more in order to get the deal done, and they are probably too embarrassed to publicly tell their friends and neighbors what their home actually did sell for. You need as much hard data on what homes actually did sell for. Don’t sign any listing papers or any documents until after you have met with every agent with whom you’ve made an interview. If, after interviewing three or four agents, you still don’t feel 100% affinity for any of them, go back to the drawing board, get more recommendations, and line up appointments with additional agents. Selling your home is one of the most important transactions you’ll do from a financial (and emotional) standpoint. You have to have complete trust in this person as being honest, hardworking, reliable and responsible. After you’ve finished the interview stage, take a couple of days to read over their written materials and suggestions with everyone involved in the sale (your spouse, children, parents, anyone else whose name is on the deed). Don’t rush into selecting your agent unless you absolutely have to, and even then, under pressure, you’ll be more inclined to make a questionable decision. If the agent(s) keep calling you, just say that you are reviewing the information and will get back to them once you’ve made up your mind. Ask for a lower commission rate; it doesn’t hurt to ask, and most agents are indeed flexible. This is especially important if your sale ends up being done with a ‘dual’ agent. That should entail a lower commission rate because only one agency is involved, not two. Instead of a four-way split (your agent, his/her agency, the selling agent and their agency), it becomes one agent, one agency deal – which translates into more money for them. Along the East Coast, a 5% commission has become the ‘discounted’ norm. You should make an attempt to negotiate your commission as a seller with the agent that you select, whether it’s a dual agency sale or not. And of course, make sure that the commission rate is in writing in the contract. As a matter of fact, everything should be spelled out very clearly and succinctly in your listing contract – including what items will be left with the house, whether or not you are willing to throw in certain items or furniture, appliances or fixtures with the home, what percentage amount of deposit you’re willing to accept, etc. It has, unfortunately, become somewhat commonplace on the East Coast for buyers to enter into a contract of sale with 10% or less of the sales price as the deposit to be held in escrow. This is very, very bad! Should the buyer’s default, should they show only lingering interest in continuing negotiations with you because another home in which they’re now more interested come onto the market, you want to have as much of their commitment as possible in terms of cold, hard cash sitting in a safe escrow account. It’s much easier to just walk away from a sale in a buyer’s mind if they only have $5,000 or $8,000 as a deposit on a home listed at $950,000. Don’t go crazy on this: you’ll scare buyers away if you demand a 50% or more cash deposit. The deposit should be in the range of at least 10% to 25% of your asking price. When you do pick an agent, do be sure to call the other agents that you interviewed and let them know. This is not only good manners but common sense as well. Chances are actually pretty good that some of these agents will be showing your house, and you want to keep on good terms with them all. The listing agent you’ve selected is familiar with your house. Ask him/her for suggestions on what they feel will make your home more marketable. Ask for suggestions for both the interior and the exterior. A big problem with which many sellers may be unfamiliar is ‘curb appeal’. I’ve known of many buyers who show up at an appointment to look at a home who won’t even get out of the car once they see it ‘in person’. One neighbor’s first showing was like that. Her home, listed at well over $1,500,000, was lovely – but had white vinyl siding! The prospective buyers, upon seeing that, decided there was no way they would pay that kind of money for a home with a white vinyl exterior. Ask your agent to be brutally honest, and to break down improvements in both areas separately. Some of them may be frankly overpriced for the return. While bathroom and kitchen remodelings generally get the most bang for the buck, consider these facts as well. A kitchen remodeling, no matter its cost, generally returns a 71% return on the money spent. That’s not to say that the remodeling job upped the value of your home overall by 71%, just that if you’re in that 71% range, you recouped your money. And then there’s the 29% who didn’t recoup their financial outlay at all. Carefully review the suggestions and decide what is do-able and what is wishful thinking. If you do decide to do some major improvements, be sure to set a budget and stick to it. There are lots of little things that you can do that will make a big difference. Don’t just clean and polish/oil your kitchen cabinets, check the handles on them as well. For a price ranging between 99 cents to $2.50 each, you can replace every kitchen cabinet handle and really spruce up your kitchen. Can’t afford to overhaul your bathrooms? Try replacing the faucets with sleek, newer styles – and while you’re at it, consider purchasing a new shower curtain, bathroom rugs, and trash can. Do you have ‘builder’s grade’ heat vents in your floors? For prices ranging from $5.00 to $25.00 each, you can easily get rid of those brown vents and replace them with gold, silver or wood-toned ones. I once toured an open house and was shocked to see a house listed for $995,000 which had some very nice features, but also had those old, standard ‘builder’s grade’ floor vents – they really stood out. It’s Time to Call in Some Chits! If you have relatives (preferably!) or friends who are in the construction business, see if you can work out some good deals with them on home improvement projects by Home Gear Kit. There may also be a number of DIY projects that your family can do. Those cheery folks at Home Depot and Lowe’s, to name just these two, promise hands-on help with remodeling projects. Some things to consider might be the addition or replacement of an outdoor deck, blacktopping your driveway, laying a new vinyl (or wood) floor in your entry hall, your laundry room, putting up new window treatments or shutters, caulking bathtubs, replacing tiles, etc. Take your ‘suggestion’ list with you to one of these stores and stroll the aisles. (Dedicate at least a day or two to doing this. Don’t rush into something without having first thought it through!) You may find faucets, bathroom vanities, mirrors, carpeting, floor tiles, even granite/marble/Formica counter and bath tops on clearance or on sale – little things like this can add up to make a big difference. Work on a project at a time until it’s completed rather than trying to tackle two or more lengthy projects. One of the first and most important things to do is to clean up the exterior of your house. Trim trees and shrubbery. Get the lawn seeded, fertilized, mowed. If you have a lot of little ‘trinket’ items – bird baths, hanging planters, lawn decorations – either clean them up or get rid of them. Less is more in this case. If there is an area that would be greatly enhanced by the addition of a tree or shrub, plant it – and try to get the largest, sturdiest and fastest-growing variety that you can. Get rid of the old car or boat you’ve been working on for the past ten years or so, or else move it to the back of your home. You want the front of your house to look CLEAN: this will give prospective buyers the impression that the inside looks as sharp and clean as the outside does. Adding a gorgeous wreath to your front door is a solid investment, as is replacing or adding new hardware to your front door. Add a gold tone or silver doorplate to the front door as well, and consider putting on a new or replacement door knocker or doorbell replacement. Put planters of vivid, colorful fresh potted flowers in central locations: by the front door, on your porch, in a hanging basket in your yard. And Speaking of the Inside – it’s Time to Pare Down! Get stuff off of the floors and into drawers, storage containers or into the closet. No buyer wants to see a pile of shoes heaped up in a corner. Get a shoe rack. If there are controversial posters or banners, consider it it’s time to do away with them. While bedrooms themselves are a reflection of an individual’s personality, you also want to show buyers that they can easily insert their own personality into that room. The same adage that applies to articles of clothing and shoes also applies to toys, stuffed animals, games, sports equipment, collectibles, hobby equipment: get it organized or get it out of there. No matter how much time, money and effort you spend on improving your home, if it isn’t neat and clean, you’ve wasted your money. Once you’ve gotten the bedrooms organized, it’s time to tackle each and every other room in your home. The hardest may very well be your basement. If you don’t, all buyers will see will be boxes of stuff (junk?) laying around, in addition to layers of dust and dirt. Remove as much as you can from your basement so that buyers can see that it is clean, dry and is as large as it is. If you have it crowded with storage items, they won’t get the true feel for the size of the area itself. The same applies to every other room as well. If you don’t use it, it’s broken, it’s not stored in the room it should be in, it takes up too much space – either move it to a more ‘hidden’ area or get rid of. Again, anything that is usable can and should be donated to charity – and be sure to get a VERIFIED receipt from that charity. The I.R.S. has specific regulations about what constitutes a valid charitable donation receipt; research this online at the I.R.S. website to make sure that you’re getting a receipt for your donations which you can use on your next tax return. If you have too much stuff crowded into a room, again the buyer won’t be able to see the room for its true size. Also, certain styles and types of furniture may take up too much room, no longer be necessary, or just be outdated. Get rid of it. Put an ad in the local paper, on Craig’s List, or take it to a consignment shop. You won’t in all likelihood get top dollar for your older furniture, but you will accomplish at least two things: you’ll be ‘opening up’ your rooms so that buyers can actually get an idea of their shapes and sizes, and how they could arrange their own furniture in those rooms, and you’ll also be getting rid of furniture now that you don’t plan to take with you to your next home. PAINT! It’s the Home Seller’s Godsend! It’s inexpensive and can actually change the look and feel (and seemingly the size) of your rooms. If you’re somewhat wary of going bald or need ideas, promptly head out to your local reputable paint store. Ask them for suggestions and color swatches. We even had the owner of one paint store come out, take a look around, and make suggestions on colors we should use for various rooms. These guys are professionals (assuming that they are indeed reputable, have been in business for a while, and carry name-brand lines of paint). You’ll want to avoid the all-white or all-beige ‘neutral’ look; your home will show in a ‘sterile’ fashion, like it had just been painted to sell, or that you have an institutional mindset! This doesn’t translate into every room being a bold Terra cotta, ruby, hunter green or ice blue color. Carefully consider first the rooms that actually NEED to be repainted, and deal with them first. Try to avoid blah colors that you think would appeal to buyers; you want to add a little visual ‘punch’ to these rooms. You can go more traditional in your living room and dining room, but a bold splash of color in the master bedroom, the master bath, one or two of the bedrooms, and the kitchen can make a huge difference in the overall feel of your home. If you can’t get a professional store owner to come out and look at your home, try to round up a friend or relative or even a neighbor who has a good eye for color and has a home whose decorating and color styles you admire. If you plan on doing the work yourself, you can save a fortune. Go out and browse several of the literal dozens of home improvement magazines (the magazines are more current and up to date than published, hardbound books, by and large). If there are particular magazines that you really like, buy them. Go online and Google ‘paint colors’ and see what pops up. If you’ll be using a professional painter, be sure to check references first. (Again, seek out recommendations and word of mouth referrals. Try to interview as many as you can before selecting a painter; you’re paying good money for a project that will have a major impact on the sale of your house.) Look to the professional painter for suggestions as to room colors as well. Having been the victim of wallpaper disasters in the past myself, I would personally advise staying away from wallpapering your rooms now. it may do more damage than good, especially if it’s a bold pattern, look or style. Your taste won’t necessarily equate to that of the prospective buyer, who will look at it as one more thing to have re-done. Another option is using wallboard. Check wallboard out at Lowe’s or Home Depot. It can be installed like wallpaper but comes in very neutral colors (usually white, sometimes ecru, eggshell or beige). Not only does wallboard give a textured feel to an area (and I certainly am not advocating doing an entire room with it, unless it’s a pretty small room), you can actually paint the wallboard once it’s been installed. If you’re handy enough to do your own wallpapering, wallboard is a great option to consider in addition to painting. While conventional wisdom was that spring is the time to list your home, the rules have changed;consider listing your home in February or early summer. Buyers with children want enough time to settle in before the start of the school year. The bottom line in making your home as presentable as possible for sale? The key is to minimize the ‘defects’ of your home while maximizing its amazing assets at as little cost to you as possible. Small rooms? Get rid of the clutter and furniture. Dark rooms? Lighten it up with paint or wallboard. No matter what your ‘problem areas’ might be, there is a surefire way to get around it without breaking the bank. Good luck – I wish you the very best in selling your home and moving forward!